Dating back to the late 11th century, the church of St, Nicholas is the only survivor of the five churches that once served the parish of New Romney. The church still displays the scars of the storm inside and out. 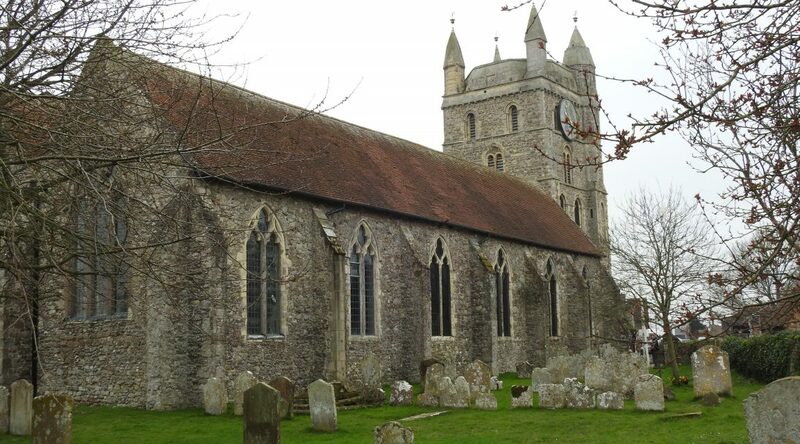 While Bishop Odo began to build St. Nicholas church in New Romney during the year 1086 near the end of the reign of his brother-in-law, William the Conqueror it was completed during the early 12th century. Constructed by Norman masons, the primary material used was Caen stone. The original building was a nave and a clerestory. Today, New Romney is an inland town but it was a thriving seaway when the church was built. St. Nicholas was right on the harbour’s head. Ships docked right at the edge of the churchyard. The congregation would have been diverse with land owners, traders and sailors all attending sermons. When not in use as a church, it was often crowded with deals being struck and business conducted. Dedicating the church to the patron saint of mariners was pretty much a given considering its position. The church must have still been relatively new when disaster struck the town in 1287. The storm deposited about four feet of silt inside the church and raised the ground level outside. The church still displays the scars of the storm inside and out. The floor is several inches lower than the surrounding ground and shadows of the silt are still visible on the columns. The town and the church survived. Extended in the 13th and 14th centuries, the additions had a more Gothic style. These extensions may have been partly to repair and replace structure damaged by the storm. The church had a chancel and two side chapels added at the eastern end of the building. By the mid 16th century, it was the only church remaining in New Romney. During the Victorian era, the church of St. Nicholas in New Romney was in dire need of restoration. The plans put forward would have meant the destruction of much of the the 12th century building. These plans were opposed both by the public and the Society for the Protection of Ancient Buildings. The outcry caused the restoration plans to be reconsidered, and it was carried out in a way that preserved the 12th century features. Restoration work is on-going with some of the most recent being the 2013 work to restore the carved door surround of the Norman west door. This revealed the true beauty of the Caen stone. Powered by WordPress & Child of Portfolio. Unless explicitly stated, all photographs are licensed under a Creative Commons Attribution-NonCommercial-ShareAlike 4.0 International License. If you wish to use any of these works commercially, please contact me. I am unlikely to say no.